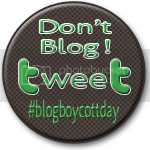 So, today is Blog Boycott Day which is hosted by the amazing Liz from A Belle, A Bean, & a Chicago Dog and all day we avoid blogs and just Tweet. I’m tired… I spent a lot of time responding to all the great comments that were left yesterday for my SITS day (#WOOHOO) that I just don’t have it in me to write a real post. Alright… that’s sort of a lie. I am tired, but since I’m going to be packing & traveling today for a weekend away with the family I figured that spending some quality time with all of you on Twitter talking the day away would be much better!